On March 11, 1811, hand loom weavers swarmed the streets of Arnold, Nottingham in the dark of night. They broke into textile factories equipped with the latest technologies, smashed pieces of factory equipment and burned the mills. Over the next five years, the movement spread throughout England. Industrialists invested in safe rooms inside their factories to protect themselves from attack. The movement died in its tracks when the government stepped in with mass trials, with over thirty men ultimately executed or transported to penal colonies in Australia. The government went on to pass legislation making equipment destruction a capital offense. The Luddites didn’t start with violence. Rather, like regular hardworking people, they expected their industrialist employers to make nice as new machines were brought in to replace workers. The employers didn’t bother because nobody made them. They found that higher profits fit quite nicely into their fattening pocketbooks. The Luddite eruption speaks to a trend that ticked up to light speed in the twentieth century. More and more workers are forced to find new careers. No one could argue that this has been a bad thing. Gone are the backbreaking labors of producing food, clothing, and life’s many necessities. We have refrigeration, vacuum cleaners, washing machines, automobiles, and iPhones. But for each of these inventions, there has been a devastating impact on jobs. Without the sense of accomplishment and self-respect that a job well done provides, modern people face an unexpected dilemma. Latest job forecasts say if you want a job in the next twenty years, you’ll need to plan for one of the following careers: registered nurse, retail salesperson, home health aide, personal care aide, office clerk, food service, customer service representative, truck driver, laborers and movers in freight, or post-secondary teaching. Machines are eating humans’ jobs talents. And it’s not just about jobs that are repetitive and low-skill. Automation, robotics, algorithms and artificial intelligence (AI) in recent times have shown they can do equal or sometimes even better work than humans who are dermatologists, insurance claims adjusters, lawyers, seismic testers in oil fields, sports journalists and financial reporters, psychological testers, crew members on guided missile destroyers, retail salespeople, and border patrol agents. Moreover, there is growing anxiety that technology developments on the near horizon will crush the jobs of the millions who drive cars and trucks, analyze medical tests and data, perform middle management chores, dispense medicine, trade stocks and evaluate markets, fight on battlefields, perform government functions, and even replace those who program software – that is, the creators of algorithms. Observers from all sides are split pretty much 50-50 on whether the result of increased technology in the workplace will be a vast reduction in available jobs or a burgeoning growth of new jobs. One could argue that for every robot providing legal services, there will be a robot repair person lingering in the hallway. Yet present-day robotics in factories don’t require a repair person for every job lost to a former factory worker, and there’s no reason to believe this would change in the future. Especially since robotic repairs are increasingly performed primarily by robots. By the time the training programs are widely available, the required skills will no longer be required. The whole emphasis of training must now be directed towards personal life skills development rather than the traditional working career-based approach. Whether or not education and training programs can keep up with the rate of technological change, none of that addresses the more personal issues of job loss. Does a former factory worker yank his kids out of school to move to another city? What about trying to sell the family home in a city that has become a ghost town? What about the aging parents who live down the street and depend on you for care? What about that skill set so laboriously learned now heaped in the trash bin as a machine produces a crude facsimile? Personal losses mount up as jobs disappear, even if free training and relocation costs are provided—which mostly they aren’t. Loss of community means, in many cases, loss of identity. Who are you in a new town where nobody knows your name? The success of Donald Trump in playing these emotions depended on his promise to workers to get their old jobs back. In just a few months since he took office, it’s become increasingly clear that those were empty promises. Coal jobs aren’t coming back. Factory jobs aren’t coming back. It doesn’t matter how many grandstanding press conferences Trump holds. In opposition to Trump’s promises to turn back the clock, the harsh realities are that not only is automation and not immigration increasingly displacing America’s middle and lower-class workers but also that the government must step in to provide relief. While conservatives fervently argue that shrinking government will reduce taxes and therefore provide much needed economic relief for Americans, the opposite is true. Government is the only entity that can solve the problem of job loss resulting from increased automation. Government must grow in order to accomplish such a gargantuan task. 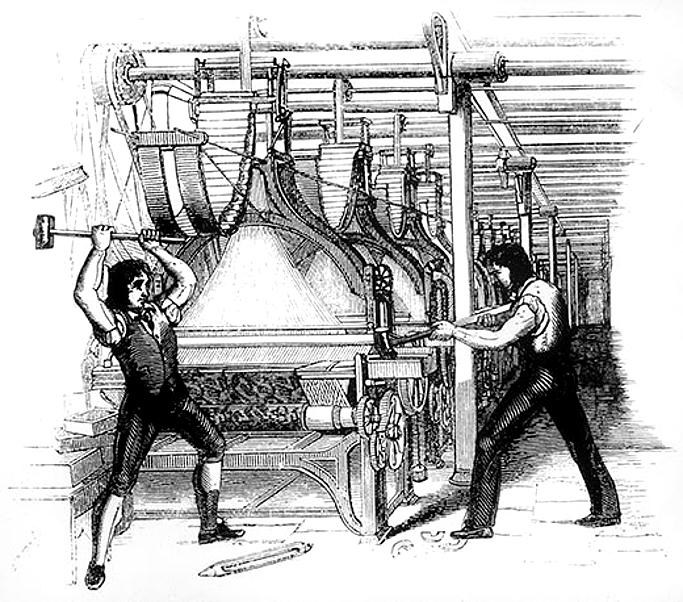 Luddites didn’t hate machinery nor did they wish to turn back the clock to eliminate machinery. They recognized that a reduction in body-breaking labor served people well. At its core, their movement hoped to bring workers together into unions that could bargain for better working conditions, protection in cases of sickness, and in general promote solidarity among workers. This in turn would offset the power of capital’s investment in machines instead of workers and its disregard for labor as a disposable element in production. People of the time recognized all the astonishing new benefits the Industrial Revolution conferred, but they also worried, as Carlyle put it in 1829, that technology was causing a “mighty change” in their “modes of thought and feeling. Men are grown mechanical in head and in heart, as well as in hand.” Over time, worry about that kind of change led people to transform the original Luddites into the heroic defenders of a pre-technological way of life. The same anxiety led to the ‘back to the land’ movement of the 1960s and ‘70s where college-educated young people left the cities to occupy remote rural farms where they consulted with old timers and publications like the Foxfire books about how to farm, tend animals, and put in sufficient stores to survive the winter in makeshift homes. Once traditional knowledge is lost, whether it’s how to grow and preserve food or how to build hand looms to knit stockings, how many millennia would it take to re-invent those skills? What repository of knowledge exists, outside of libraries which require literacy and—even more fragile—digital information, that can transfer thousands of years of human learning to the next generation? Once we rely on automatons to build our homes, provide our medication dosages, and produce our crops, what happens when they fail? At its core, the Luddite movement sought protection for workers so that in the case of advancing technology, mechanisms installed by the industrialist and enforced by the government would provide for the workers’ welfare. Whether retraining, retirement, or a modest stipend in unemployment income, some provision must be made to care for those displaced by technology. After all, machines vastly increase profits by speeding up production. Some of those profits should benefit the former workers instead of lining the pockets of the already wealthy. The discussion needs to be had. We need to understand that corporate investment in advancing automation does not necessarily mean that it rests on the workers alone to solve their under- or unemployment problems. They didn’t cause the problem. Corporations should be taxed at rates sufficient to provide better options for cast-off workers. Increased profits resulting from automation should automatically be taxed at a very high rate to offset worker losses from displacement. Modern culture needs to recognize that as we move deeper into a post-industrial, automated world, increasing numbers of people will not have jobs as we understand them today. Political leaders are sorely needed who will clearly voice this reality and put forth meaningful alternatives to ridiculous and empty proposals like Trump’s promise to bring back coal jobs. This entry was posted in American Culture, current events, Economics, government, Human History, social problems and tagged artificial intelligence, brave new world, employment, future jobs, Luddites, rise of the machines, robots, technology, work on June 9, 2017 by Denele Campbell.